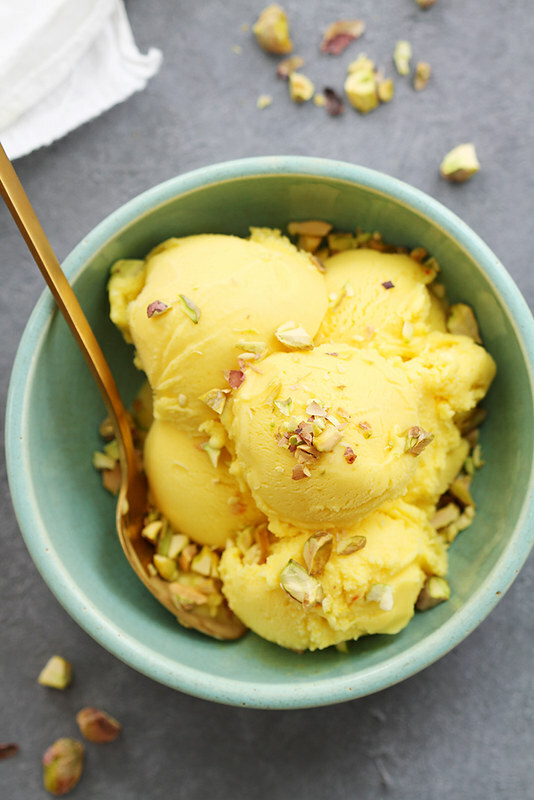 What I find harder to believe than the fact that I’ve never tried such a thing as saffron ice cream before making this recipe is that I’d never actually HEARD of saffron ice cream. I’d heard of pears and blue cheese, mushrooms and walnuts, soy and blueberries, sunbutter and sunflowers in ice cream — and even tried a few (that pear and blue cheese combo is from Salt & Straw in Portland and it is bonkers delicious) — but the saffron spice always eluded me in ice cream form. Until today. And for you, too. 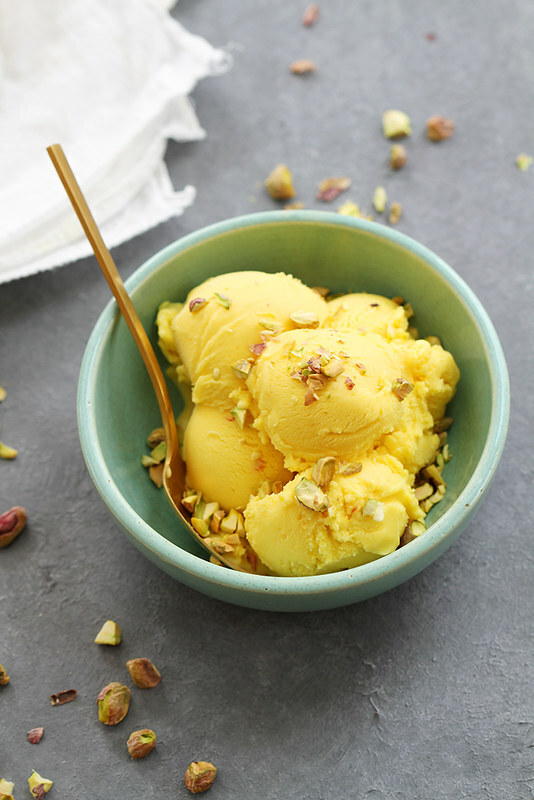 Now we can all try this sweet saffron-infused ice cream topped with shards of roasted pistachios and know that we have tried what may be the new trend in ice cream for 2016. I’m calling it. by Anissa Helou. The book, cover to cover, is filled with stunning photographs of baklava, pumpkin halva, aniseed biscotti, homemade almond milk, date “granola”, Turkish pistachio cake and more, each accompanied by equally mouthwatering recipes. 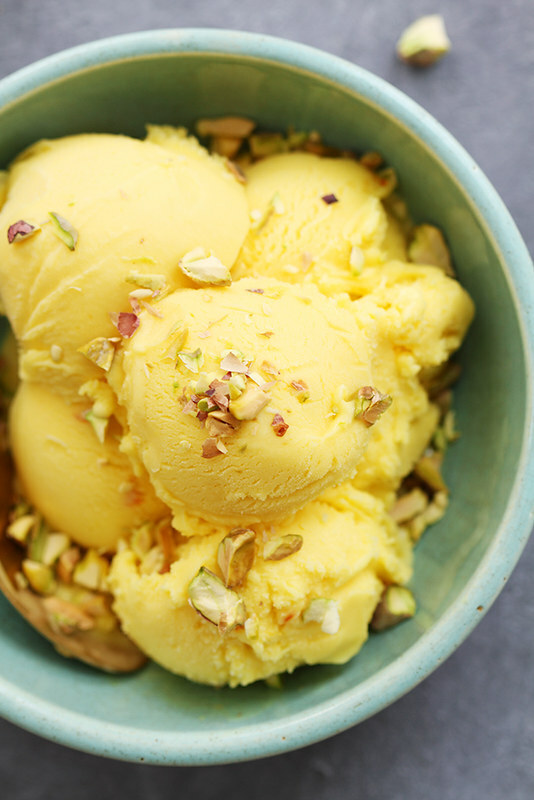 This saffron ice cream is included, and according to Helou, it can be found in Iran, often with frozen shards of cream inside (!!!). This variation doesn’t have those because it’s a bit fussy to produce those according to Helou, but the end result is still outstanding — and unlike any other ice cream I’ve ever tried. The pale golden hue alone is swoonworthy, but what I really love about this ice cream is its texture and flavor. It’s perfectly soft and smooth and incredibly creamy, and the taste is distinctly saffron — which in itself has an elusive description. To me, its taste is a cross between something like warm honey, grass and the sea. How’s that for a narrow profile? Though this ice cream was never meant to be boxed into a corner like that. It’s definitely more of a scene stealer. Lest you think that because this ice cream is made with saffron it must be expensive to make, it really only takes one generous pinch of the crimson threads to give the entire batch its signature color and flavor. The rest is comprised of organic cane sugar, crème fraîche, milk, cornstarch, sea salt and orange blossom (or rose) water, which I actually found at World Market. Helou writes that, in the Middle East, sweets and desserts are a big part of the region’s hospitality. I love that. 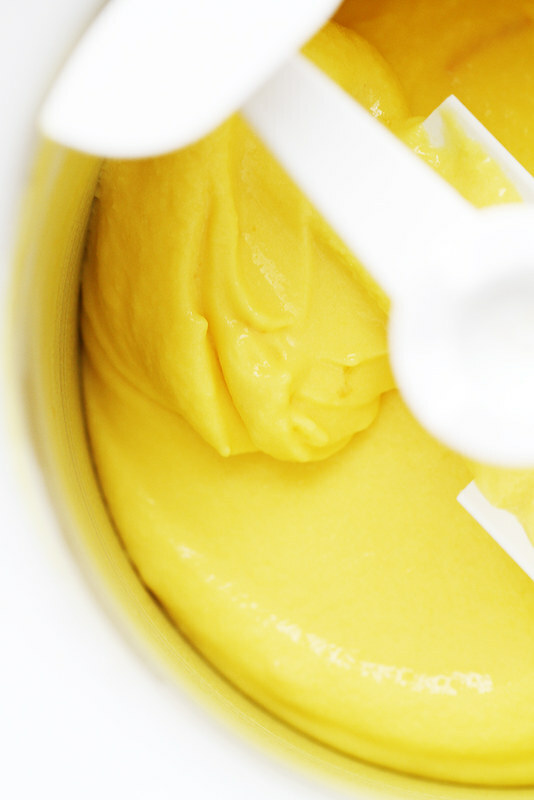 Not only do I treasure that notion myself, but it makes me want to make batches of saffron ice cream any time we have guests in our home to make them feel cared for and welcome. Plus, it gives me an excuse to enjoy this ice cream over and over again. In small bowl, whisk cornstarch with 1/2 cup milk. Pour remaining 1 1/2 cups milk in small saucepan. Add saffron and salt. Let saffron infuse in milk for 30 minutes. Heat saucepan over medium-high heat. Whisk in cornstarch-milk mixture. Continue whisking until milk begins to boil and mixture thickens. Reduce heat to medium-low. Add sugar and continue whisking 10 minutes. Remove mixture from heat and transfer to 2-quart measuring cup or bowl. Whisk in crème fraîche and orange blossom (or rose) water. Cover cup or bowl with clean kitchen towel and let cool completely, whisking every few minutes to prevent skin from forming. Once completely cooled, cover mixture directly with plastic wrap and refrigerate 4 hours until thoroughly chilled. Transfer mixture to ice cream maker and process according to manufacturer’s instructions. Transfer to airtight container and freeze 10 minutes uncovered (to avoid formation of ice crystals). Cover tightly and freeze up to 1 month. Serve sprinkled with chopped pistachios. Disclosure: I received a copy of “Sweet Middle East” for review purposes only. All opinions are my own. This post contains affiliate links. OK twin, I bought my first saffron this weekend to make paella and have been wondering what to do with it next. And here you are with my answer! Sounds like I need to get my hands on that cookbook!! You just made my day, or quite possibly year, with this amazing ice cream recipe. Alex’s favorite spice is saffron, and he is always asking me to put it in everything (why is it so expensive?!). Haha. I’ll definitely be making this for both of us soon. 🙂 Pinning and sharing on social today! So gorgeous, this looks like a bowl of sunshine! And those pistachios sprinkled over the top… perfection! That’s just gorgeous!! I’m in love with the color and canonlynimagine how wonderful this tastes. 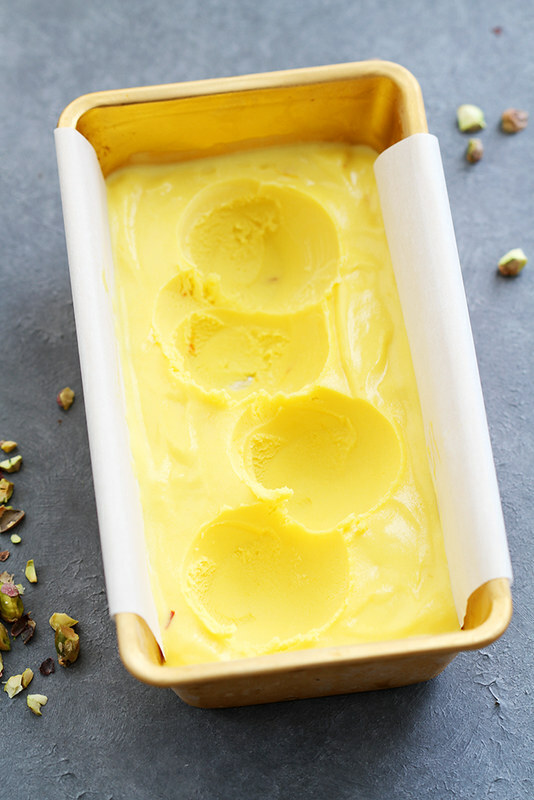 I imagine that saffron ice cream isn’t a thing because how expensive saffron is and that even though it’s not necessarily expensive to make saffron ice cream there’s some residual sticker shock. This does sound delicious- I love your description of saffron being like warm honey, grass, and the sea; and the color is like sunshine. Looks so yummy! I will give it a try tomorrow. Thanks Stephanie.